Where Have All the Astronauts Gone? The public pays little attention to manned space flight and seems to believe that little has changed. They see in films a massive NASA organization training cadres of astronauts for flight. This is partly due to NASA's own publicity, with popular films portraying a future they wish will happen. Yet if you visit astronaut training facilities these days, you may feel you are visiting a museum. The once-bustling simulators and training halls are quiet. Where have all the astronauts gone? In 1965-1973, during the heyday of the space race, Russia and America together launched around 10 astronauts per year into space. From 1973-1981, the Russians soldiered on alone, with their Almaz and Salyut space stations, keeping the rate just under ten per year. Then the space shuttle came on line, with up to eight seats per flight. 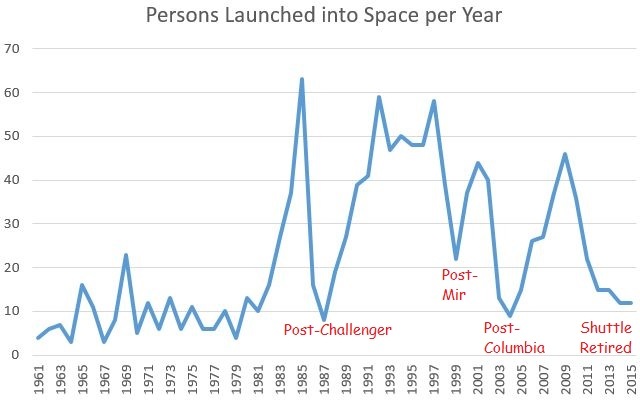 From 1981-2009, total persons launched per year would climb to nearly 60 per year, but fall back drastically each time a shuttle was lost. The base rate, below ten, represented crews launched to the Mir space station. With the shuttle retired, the only people flying to orbit are the rotating crews to the International Space Station, plus the occasional Shenzhou crew. The rate has fallen again to pre-shuttle levels of just over ten per year. 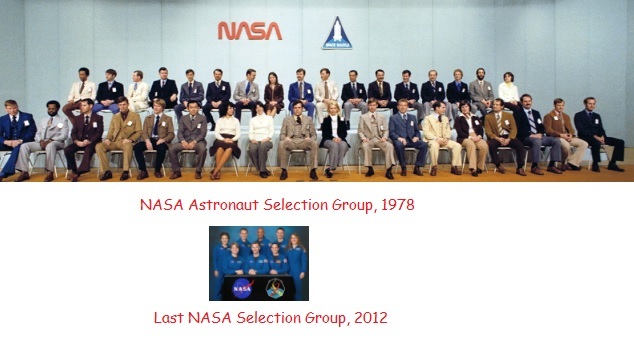 What that means is big reductions in the astronaut corps. Those who remain are having to wait a very long time for a chance to fly. Although the US paid 90% of the cost of building the ISS, it is now a mainly Russian enterprise. Three-person ISS crews include only one American. The other two seats go to Russians (around a 15% of the time the third seat will be European or Japanese rather than Russian). On the other hand, those who get to fly do so for a much longer period than before. The typical ISS expedition crew stays for six months, as opposed to a week or two on a shuttle mission. 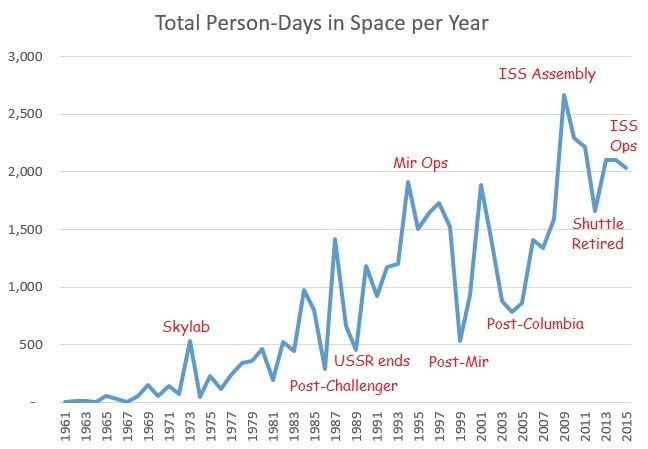 So in terms of person-days in space, the ISS means that statistic will remain at historically high levels. How long this rate will continue depends on how long the ISS can avoid a serious operational disruption. This could be a catastrophic equipment failure aboard the station, or in the Soyuz resupply lifeline. While the Soyuz has always been put back into service quickly after booster or spacecraft failures, worsening political relations between the US and Russia makes a flight cessation a possibility. What happens in the long term is vague at this point. The Dragon or CST-100 commercial crew vehicles should allow America to start sending its own (larger?) crews in 2018. The ISS is supposed to be kept in service as long as possible after 2020. Thereafter the Russians hope to separate their portion and create a separate Russian space station. The Chinese station will come on line sometime in the 2020's. America has no governmental station plans after the deorbit of ISS, looking only at low-rate deep space exploration using the Orion capsule. However space tourism, thanks to SpaceX and Bigelow, could lead to a near-space boom. Unfortunately manned spaceflight at this point relies on bureaucratic momentum. Barring a major change in political attitudes toward spaceflight, the commercial side offers the only hope for long-term human expansion into space. As they say, "No bucks, no Buck Rogers..."